What dog owner loves picking up dog poop after their pets? Nobody loves that, but that's part of the deal when you adopt a dog. Today, there are far more tools to help pet owners clean up after their dogs, like best dog poop scoopers and dog poop bags, that make the process quick and without having to get your hands dirty. In our quest to find the most effective, best dog pooper scoopers for dogs we've tested and reviewed some of the most popular brands out there. Based on their price to value ratio, pet poop scooper's sturdiness, functionality, features and poop scooper reviews from other pet owners, it was easy to see which brands stand out the most. * Click on the best dog poop scooper for more information and prices, or scroll down below for more details, reviews and our notes for each. Why use a dog pooper scooper, and who to pick the best one? According to LiveScience.com website, just in the United States alone there are 83 million dogs that produce more than 10 tons of poop every year. It's been proven that pet waste contains various bacteria, parasites and viruses. Once these things leach into the ground, they contaminate water. Most of us find picking up pet waste a disgusting thing to do. But if you're inclined to clean up after your dogs, the main reason to buy one of the best dog pooper scoopers is to avoid the daily hassle of bending and picking up poop, even if you do this using dog poop bags. The problem is that some dog poop scoopers create more problems than they actually help. Your most ideal pet pooper scooper should allow to easily pick up pet waste and transfer it into the dog poop bag without much intervention from the owner. For more details on how to pick the best dog pooper scooper, watch and read this guide. 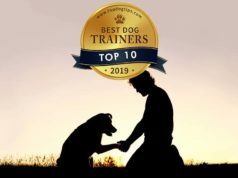 For the below list of best dog poop scoopers, we've used several factors and testing methods to find the most optimal and cost-effective, cheap pet pooper scooper that does the job with very little intervention from the handler. To see the side-by-side comparison of the top rated brands, watch this comparison video. What Are the Best Dog Poop Scoopers in 2018? The best dog poop scooper on this list – Nature's Miracle 2 in 1 Rake n Spade with a pan. Just by looking at this earth-friendly dog poop scooper you can tell its quality is better than those listed below. Nature's Miracle have created this one as an improvement over their previous version at the 2nd place on this list. While the design may not seem sophisticated, its simple idea actually works the best. You'll be able to easily pick up and eliminate dog poop with this tool without the need to bend or do much else; just put it down, use its features and scoop up your pet's droppings in a matter of seconds from any kind of surface, whether it's grass or concrete. Its non-stick materials are very useful if you don't like cleaning the scooper, and just like the previous one, you can purchase Rake n Spade with a LED light waste basket bag holder with extra thick, antimicrobial poop bags included. One of the best things about this pooper scooper is that there are no springs, so you don't have to worry about breaking anything here, and you'll know that because of its simplicity and sturdy build, this dog poop scooper will last you much longer than any other. Pet owners are praising the item in scooper reviews on Amazon for the reliable build and ease of use. With Rake n Spade, dog owners don't have any problems picking up after their dogs on grass, dirt and even through rocks. This is the most solid best dog poop scooper you can find on Amazon. How to switch between the spade and the rake? Simply slide the rake/spade down or up depending on which one you're going to use. Will this work on fresh dog poop? Due to its rake/spade's design, this pooper scooper is the best one for fresh poop. Can you stand up the pan? Yes, the pan stands by itself, or can be hanged by the hook. Another one from the same company, this second best dog pooper scooper earth friendly comes at a much cheaper price. Nature's Miracle Jaw dog poop scooper is your lightweight spring-action winner in this price range. You can easily pick up after your dog on any kind of service without much trouble: grass, concrete, cement, gravel, etc. The plastic is 100% non-stick, so you won't need to worry about washing or scrubbing off old dried out poop from it afterwards. Another great feature of this pooper scooper is its antimicrobial product protection. Finally, this dog poop scooper is even cheaper than #4 and #3! At such a price and for this type of quality, it's difficult to argue with this option. These poop scoopers are available in two sizes: medium and jumbo, which is very convenient. In addition, you can also get this Jaw Scoop with a LED waste bag holder, which is amazing. You get 15 safe, extra thick, antimicrobial waste baskets and the LED light on the pooper scooper features steady, strobe and blinking functions for safety. It's absolutely amazing during late evening or night walks with your dog. This is one of the more popular scoopers on Amazon as well, as customers seem to be raving in this dog poop scooper review section, mostly about its sturdiness and special features. Finally, unlike the Poop Patrol from Noz2Noz, this dog poop scooper's spring is actually very sturdy, functional and makes the job of picking up poop a breeze. Back to basics, dog owners. Best dog pooper scooper from Four Paws is your most simple yet reliable equipment which you won't regret purchasing. Even though the price is higher than the action-spring one, at least Rake Set for Pet Waste Removal from Four Paws will definitely provide reliability in terms of its functionalities because there are none. This is basically an improvement over the previously mentioned #5 dog poop scooper, the Wire Rake set. The same rust-resistant build, same comfortable rubber grip and same durable materials. It's a great, simple item to use in your backyard and leave it outside without being worried. A lot of pet owners find this simple dog poop scooper to be the best one they ever had, primarily for grass. Note that this rake's teeth are not as flimsy as you might initially expect – they are sturdy and will survive a lot of pressure from you when picking up your dog's poop. You're also able to really dig into the grass with them without being worried about teeth bending. The only issue with Rake Set from Four Paws is the flimsy pan itself, because you can't put too much pressure on it. Be careful of the angle when pushing on the pan trying to get to the level of that dookie your pooch left; it will cause bending and might eventually snap the back plate. This is only true for strong pushers – if the grass isn't tall and thick, you won't have to worry about this. Next item on the list of best dog poop scoopers has shot up in price because it's not your basic pooper scooper. This one is made by the famous dog company Noz2Noz, and their Poop Patrol Jaw Scoop will make your job even easier than the grass dog poop scooper with rake sets due to its design. Despite its size and looks, this poop scooper is very lightweight and the plastic is washable. You get the 1-handed spring action option in here, which is convenient and makes picking up your dog's poop take just a second. You can use this dog poop scooper pretty much anywhere: cement, concrete, grass, dirt, gravel and so on. While it looks somewhat long, the pooper scooper is only 27 inches in length to prevent any excessive bending. Noz2Noz's Poop Patrol is made from high quality and heavy duty materials to ensure that it will last a long time, and its finger grips are made to use the poop scooper in the most comfortable way possible. However, despite the build quality, note that a few customers found this dog poop scooper not to be sturdy enough. Primarily, some customers complained about this scooper's spring, which supposedly isn't strong enough to make the job of picking up after your dog that much easier. On the flip side, other dog owners have praised that very same thing. It looks like this part of the dog poop scooper comes down to preference; one might not find the spring-action strong enough while it will work great for others. Overall, it's a decent item for the price, but the next one on this list of best dog poop scoopers is worth paying a few extra dollars. Dog owners looking for the most practical yet cheap best dog poop scooper should consider our cheapest suggestion on this list – Wire Rake Scooper for Grass. It's definitely one of the better pooper scoopers if your dog often goes on the grass, and for the price, it's difficult to beat. Wire Rake's design is simple and straightforward; you will feel like you're ready to do some gardening work, but if that doesn't bother you, this scooper for poop will do its job well. Sometimes, you can buy a rake set or a spade set of these pooper scoopers, but very often they aren't available due to high demand. In the most simple sense, this dog pooper scooper will make your everyday job of picking up after your canine much easier and more sanitary. The build of this dog poop scooper feels sturdy and you can tell that it's made from solid materials. But then again, it's really difficult to screw up such a simple item with no additional components. The best thing about Wake Rake scooper is that it's rust-resistant, so you can always leave it outside, even if you live in Seattle. Finally, small details like its rubber grip can also sell you on the item – as most dog poop scooper reviews note, it's a comfortable grip for anybody who will use such pooper scooper very often. 6. Precision Pet Little Stinker Heavy Duty Scoop (large, heavy duty, steel) – Not the cheapest option of the bunch, but arguably one of the best dog pooper scoopers of this design type: heavy duty steel pan and spade that will make quick use of pet waste of all sizes and on most surfaces. It has an extra long handle, it's easy to store and wash, and there's no assembly required for it. You can store it outside in the rain or in the sun. 7. Spotty Metal Tray with Rake (large, light, aluminum) – A much cheaper spade and pan set of pet poop scooper this one is similar to the above in design except it's not heavy duty and feels much cheaper, and lighter (which could be both a good and a bad thing). Not assembly is required for this pet poop scoop and the rake and pan snap together for easy storage. It can be stored outside in any weather, including rain and direct sunlight. 8. Complete Poo Pack Scooper (small, plastic) – Venturing away from the long pan/rake designs, this dog poop scoop is great for quick and easy everyday use, especially for walks when you plan to carry it for longer. Due to its smaller size, it's much easier to carry, and the plastic materials make it very lightweight. This pet poop scooper also comes with a bonus of a dog poop bags dispenser and two sets of dog poop bags which can be used directly with this pooper scooper. 9. Petphabet Easy Patrol Jaw Scooper (small, plastic) – Similar design to the above jaw poop scooper, this one is offered in several different colors and with no bonus of dog poop bags or dispenser. 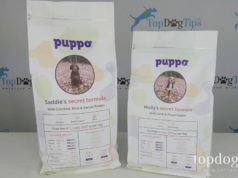 However, it's also cheaper than the above pet scoop and currently has been more positively reviewed by a large number of pet owners. This is a great option for pet owners who'd like to carry their pet pooper scooper with them for a while. 10. Dogit Jawz Waste Scoop (small, plastic) – One of the original small dog pooper scoopers made specifically for picking up pet waste on grass and handling it with one hand, this one currently is one of the cheapest best pet poop scoopers you can find. It's a very ergonomic and practical design with clearly defined “teeth” to easily pick up waste off the grass. Due to the spring loaded feature, you can pick the poop with one hand and drop it into the dog poop bag you hold in another hand. 11. Four Paws Large Rake Set (large, light, aluminum) – Back to sets of dog poop rakes, spades and pans, this is a good alternative to the above mentioned best dog poop scoopers that are more expensive. This is a cheaper alternative, but it's not without its flaws. While it works for picking up pet waste, it doesn't have some of the handy features of the two more expensive dog poop scoops related to its storage. However, you can store this pet scooper in the sun and in rain (it's rust-resistant). 12. Tidy Turd Scooper with Leak Proof Poop Bags (small, plastic) – A very popular best dog poop scooper, the Tidy Turd was one of the brands we've featured in our side-by-side comparison, and it works very well for what it's designed to do. One handed operation is comfortable, and it's best for picking up dog poop off the grass. Considering this is made of plastic, the design is actually very sturdy and doesn't feel cheap. It's a good price for the value, and can be easily used with dog poop bags. 13. Petmate Clean Response Waste Management System (large, light, plastic) – This is a mixture between regular tall design of pet pooper scooper rakes with spades and pans, and the plastic best dog poop scoopers. It works good for places where it's generally very easy to sweep old/dry poop, like off of concrete, but doesn't do a good job of pet waste that's fresh/moist or is in tall grass. The main advantage of this poop scoop is its large capacity and a comfortable grip handle. 14. Favorite Foldable Pet Waste Jaw Clamp (small, plastic) – Another similar design we've seen before, but for a much cheaper price. Favorite's pet poop scooper works just as well as the above pricier dog scoopers, and doesn't offer any special features that we haven't seen before. It does come in a new color which you can't get elsewhere, and the price tag of this option simply makes it more worth it. This dog poop scooper is best for grass, just like most other small plastic scoopers. 15. PETMAKER 80-PET5060 Portable Heavy Duty Shovel (medium, aluminum + plastic) – This is an original design compared to all other best dog poop scoopers for dogs we've discussed so far. The design is a mixture between the heavy duty pan with handles and the one-handed operation jaw scoops. However, while it's advertised as a heavy duty pan for dog poop, it doesn't stand up to its claims. The feel of this dog poop scoop is exactly as its cheap price tag; however, this may work perfectly well for some dog owners and their pets. Now it's your turn: have you tested and tried any of these fifteen best dog poop scoopers for dogs? If so, what have you found to be most effective and which scooper was most comfortable to use? Let us know! What to look for in the best dog pooper scooper? Choosing best dog poop scooper isn't rocket science, because the way they are built, essentially, you could've made one if you wanted to. So the main thing to look for in a pooper scooper is sturdiness and reliability. Some of them will have a spring-action closing pan, and others will manually handled. That's not to say one is better than the other, and it depends on your preference: a little more convenience over reliability? If right now you're thinking that you do not need a dog poop scooper for your home, then maybe you should stick with that opinion, because majority of pet owners who purchase a pooper scooper get converted and they never come back from the dark side. It's that convenient. A few more things to look out for. Make sure your dog pooper scooper is lightweight, because you're going to be taking this thing with you every time you know your pooch needs to go number two. Even though most of these pooper scoopers are already made out of lightweight materials to ensure mobility, some are lighter than the others, so consider this to be factor when choosing best dog poop scooper. Think if you need something where you'll have one hand free (spring action scoopers), or if you don't mind using both hands to scoop up your pet's leftovers. Again, it doesn't mean that one is better than the other; it's simply depends on your preference. Outside of these few features, there are not that many differences between dog poop scoopers, and sturdiness, reliability will be (or should be) how you judge you next pooper scooper. Is there a spring version that is made from all or mostly metal? I bought one last year that was supposed to be well made, and the parts of the side broke yesterday. I don’t mind paying substantially more if it lasts a long time.